Tales from the Borderlands ends on a more human note with “The Vault of the Traveler,” as it manages to make everyone in its cast, from the most despicable to the most mechanical, feel like a living, breathing person through the course of the episode. Much of Telltale’s take on Pandora has excelled due to its stellar writing, difficult choices, and hysterically dark sense of humor, but “The Vault of the Traveler” closes the curtain on Rhys and Fiona’s story with the series’ most emotionally-charged scenes. In its final hours, Tales from the Borderlands delivers moments I wouldn’t have thought it was capable of when Rhys and Fiona first met on Pandora in “Zer0 Sum,” and while there are certainly moments of laughter-inducing comedy, “The Vault of the Traveler’s” best moments come from the ones that are dark, humanizing, and rooted in sacrifice. “The Vault of the Traveler” begins immediately after Handsome Jack has taken over Helios (whether by force or with the help of Rhys), and the space station then erupts into chaos as the presumed-dead dictator begins to wreak havoc upon Hyperion’s staff. While the end result is disappointingly similar regardless of what the player chose to do, Jack’s role in Tales from the Borderlands ends with perhaps the series’ most gut-wrenching sequence, one that shows a side of Jack that wasn’t even seen in Borderlands proper. 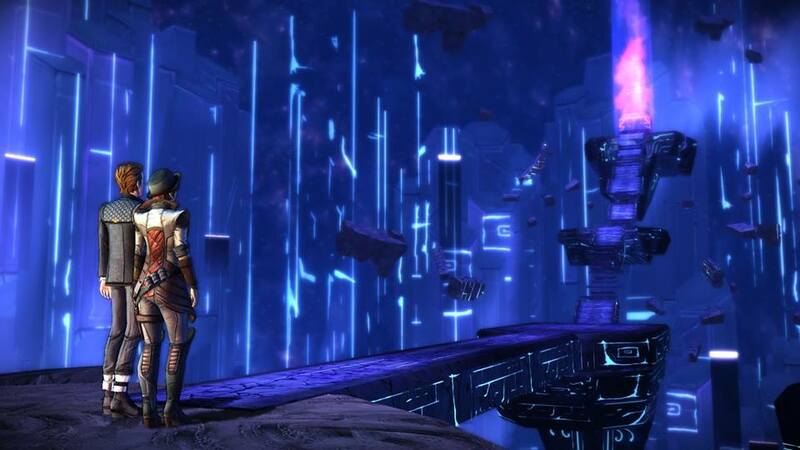 As the final episode of the series, “The Vault of the Traveler” is also the culmination of all your choices as Rhys and Fiona throughout the series. The way that even the smallest of choices factor into the end of Tales from the Borderlands is clever, and was also something I wouldn’t have predicted going into the episode. Everything from how you treated a person in passing, how you presented yourself to your enemies, and even how much money you spent over the course of the series has a consequence you can point to in “The Vault of the Traveler.” It may not be anything that will alter the course of the story, but it’s still something tangible, and will give players something to discuss as they each see what options are available to them thanks to their choices across each episode. These consequences will change the way the final action sequences play out, which are some of the best-choreographed scenes Telltale has designed. Thanks to its setting, Tales from the Borderlands has had some of the more elaborate set pieces of Telltale’s recent offerings, but “The Vault of the Traveler” takes this a step further by taking the QTE format the studio often utilizes and making it a little more complex and involving, as well as unique based on your decisions. But even with the reveals and the consequences, “The Vault of the Traveler,” and ultimately Tales from the Borderlands as a whole, shines in the humanity it brings to those living on the spinning deathtrap that is Pandora. Rhys and Fiona’s story is unlike the majority of Borderlands. It lacks the same barbaric “every-man-for-himself” morality that fuels the looting and grinding in favor of a tale about people that would be viewed as the worst Pandora has to offer banding together for more than just profit, bloodlust, or a Vault. Telltale has told what is probably the most intimate and sincere story told in Gearbox’s universe, and it’s one I won’t soon forget. Tales from the Borderlands concludes with some series-defining moments and choices, solidifying it as one of Telltale's best, if not the strongest offering the studio has put forth in several years. Telltale’s take on Gearbox’s beloved series is the most heartfelt story told on Pandora, and is full of incredible moments of comedy and grueling choices.